Washington D.C., 31 March 2004 - "I think we ought to take every step that we can, be prepared to do everything that we need to do," President Johnson instructed his aides regarding preparations for a coup in Brazil on March 31, 1964. On the 40th anniversary of the military putsch, the National Security Archive today posted recently declassified documents on U.S. policy deliberations and operations leading up to the overthrow of the Goulart government on April 1, 1964. The documents reveal new details on U.S. readiness to back the coup forces. The Archive's posting includes a declassified audio tape of Lyndon Johnson being briefed by phone at his Texas ranch, as the Brazilian military mobilized against Goulart. "I'd put everybody that had any imagination or ingenuity…[CIA Director John] McCone…[Secretary of Defense Robert] McNamara" on making sure the coup went forward, Johnson is heard to instruct undersecretary of State George Ball. "We just can't take this one," the tape records LBJ's opinion. "I'd get right on top of it and stick my neck out a little." Among the documents are Top Secret cables sent by U.S. Ambassador Lincoln Gordon who forcefully pressed Washington for direct involvement in supporting coup plotters led by Army Chief of Staff General Humberto Castello Branco. "If our influence is to be brought to bear to help avert a major disaster here-which might make Brazil the China of the 1960s-this is where both I and all my senior advisors believe our support should be placed," Gordon wrote to high State Department, White House and CIA officials on March 27, 1964. To assure the success of the coup, Gordon recommended "that measures be taken soonest to prepare for a clandestine delivery of arms of non-US origin, to be made available to Castello Branco supporters in Sao Paulo." In a subsequent cable, declassified just last month, Gordon suggested that these weapons be "pre-positioned prior any outbreak of violence," to be used by paramilitary units and "friendly military against hostile military if necessary." To conceal the U.S. role, Gordon recommended the arms be delivered via "unmarked submarine to be off-loaded at night in isolated shore spots in state of Sao Paulo south of Santos." Gordon's cables also confirm CIA covert measures "to help strengthen resistance forces" in Brazil. These included "covert support for pro-democracy street rallies…and encouragement [of] democratic and anti-communist sentiment in Congress, armed forces, friendly labor and student groups, church, and business." Four days before the coup, Gordon informed Washington that "we may be requesting modest supplementary funds for other covert action programs in the near future." He also requested that the U.S. send tankers carrying "POL"-petroleum, oil and lubricants-to facilitate the logistical operations of the military coup plotters, and deploy a naval task force to intimidate Goulart's backers and be in position to intervene militarily if fighting became protracted. Although the CIA is widely known to have been involved in covert action against Goulart leading up to the coup, its operational files on intervention in Brazil remain classified-to the consternation of historians. Archive analyst Peter Kornbluh called on the Agency to "lift the veil of secrecy off one of the most important episodes of U.S. intervention in the history of Latin America" by completely declassifying the record of CIA operations in Brazil. Both the Clinton and Bush administrations conducted significant declassifications on the military regimes in Chile and Argentina, he noted. "Declassification of the historical record on the 1964 coup and the military regimes that followed would advance U.S. interests in strengthening the cause of democracy and human rights in Brazil, and in the rest of Latin America," Kornbluh said. On March 31, the documents show, Gordon received a secret telegram from Secretary of State Dean Rusk stating that the Administration had decided to immediately mobilize a naval task force to take up position off the coast of Brazil; dispatch U.S. Navy tankers "bearing POL" from Aruba; and assemble an airlift of 110 tons of ammunition and other equipment including "CS agent"-a special gas for mob control. During an emergency White House meeting on April 1, according to a CIA memorandum of conversation, Secretary of Defense Robert McNamara told President Johnson that the task force had already set sail, and an Esso tanker with motor and aviation gasoline would soon be in the vicinity of Santos. An ammunition airlift, he reported, was being readied in New Jersey and could be sent to Brazil within 16 hours. Such U.S. military support for the military coup proved unnecessary; Castello Branco's forces succeeded in overthrowing Goulart far faster and with much less armed resistance then U.S. policy makers anticipated. On April 2, CIA agents in Brazil cabled that "Joao Goulart, deposed president of Brazil, left Porto Alegre about 1pm local time for Montevideo." The documents and cables refer to the coup forces as "the democratic rebellion." After General Castello Branco's takeover, the military ruled Brazil until 1985. Note: Documents are in PDF format. You will need to download and install the free Adobe Acrobat Reader to view. 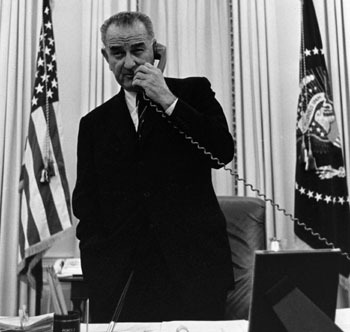 In this 5:08 minute White House tape obtained from the Lyndon Baines Johnson Library, President Johnson is recorded speaking on the phone from his Texas ranch with Undersecretary of State George Ball and Assistant Secretary for Latin America, Thomas Mann. Ball briefs Johnson on that status of military moves in Brazil to overthrow the government of Joao Goulart who U.S. officials view as a leftist closely associated with the Brazilian Communist Party. Johnson gives Ball the green light to actively support the coup if U.S. backing is needed. "I think we ought to take every step that we can, be prepared to do everything that we need to do" he orders. In an apparent reference to Goulart, Johnson states "we just can't take this one." "I'd get right on top of it and stick my neck out a little," he instructs Ball. Ambassador Lincoln Gordon wrote this lengthy, five part, cable to the highest national security officers of the U.S. government, including CIA director John McCone and the Secretaries of Defense and State, Robert McNamara and Dean Rusk. He provides an assessment that President Goulart is working with the Brazilian Communist Party to "seize dictatorial power" and urges the U.S. to support the forces of General Castello Branco. Gordon recommends "a clandestine delivery of arms" for Branco's supporters as well as a shipment of gas and oil to help the coup forces succeed and suggests such support will be supplemented by CIA covert operations. He also urges the administration to "prepare without delay against the contingency of needed overt intervention at a second stage." Ambassador Gordon updates high U.S. officials on the deterioration of the situation in Brazil. In this cable, declassified on February 24, 2004 by the LBJ Presidential Library, he reiterates the "manifold" need to have a secret shipment of weapons "pre-positioned prior any outbreak of violence" to be "used by paramilitary units working with Democratic Military groups" and recommends a public statement by the administration "to reassure the large numbers of democrats in Brazil that we are not indifferent to the danger of a Communist revolution here." The CIA station in Brazil transmitted this field report from intelligence sources in Belo Horizonte that bluntly stated "a revolution by anti-Goulart forces will definitely get under way this week, probably in the next few days. The cable transmits intelligence on military plans to "march toward Rio." The "revolution," the intelligence source predicted, "will not be resolved quickly and will be bloody." Secretary of State Dean Rusk sends Gordon a list of the White House decisions "taken in order [to] be in a position to render assistance at appropriate time to anti-Goulart forces if it is decided this should be done." The decisions include sending US naval tankers loaded with petroleum, oil and lubricants from Aruba to Santos, Brazil; assembling 110 tons of ammunition and other equipment for pro-coup forces; and dispatching a naval brigade including an aircraft carrier, several destroyers and escorts to conduct be positioned off the coast of Brazil. Several hours later, a second cable is sent amending the number of ships, and dates they will be arriving off the coast. This memorandum of conversation records a high level meeting, held in the White House, between President Johnson and his top national security aides on Brazil. CIA deputy chief of Western Hemisphere operations, Desmond Fitzgerald recorded the briefing given to Johnson and the discussion on the progress of the coup. Defense Secretary reported on the movements of the naval task force sailing towad Brazil, and the arms and ammunition being assembled in New Jersey to resupply the coup plotters if necessary. The CIA station in Brazil reports that the deposed president, Joao Goulart, left Brazil for exile in Uruguay at l pm, on April 2. His departure marks the success of the military coup in Brazil.